Many of the wide range of games offered at PokerStars can be played with different betting structures. The betting structure for a particular game sets the limits for how much you are allowed to bet each time it’s your turn to act, and in the case of the CAP games, how much you can bet in total on each hand. Note: Not all limits are offered in all games, and some limits are only offered as part of Mixed Games. PokerStars currently offers Fixed Limit real money poker at stakes from $0.02/$0.04 to $1000/$2000, as shown below. * On the second betting round (fourth street) of Seven Card Stud only (not Stud Hi/Lo or Razz), if there is a pair showing on any player’s board, any player may choose to bet or raise the higher amount (as in the last three betting rounds). Once someone bets the higher amount, any further bets or raises must be in increments of that amount. PokerStars also offers Pot Limit and No Limit games ranging from $0.01/$0.02 to $200/$400. In No Limit poker, you can bet any amount at any time - your bet size is limited only by the amount of money you have brought to the table. However, all bets must be at least the size of the big blind, and all raises must be at least the size of any previous raise on the same betting round. In Pot Limit poker, players are allowed to bet any amount up to the size of the pot, or however much money they have brought to the table, whichever is less. For No Limit and Pot Limit games, the ‘Stakes’ column in the PokerStars lobby indicates the Small Blind and Big Blind in that game. In Mixed Games (HORSE, 8-Game, Mixed PLH/PLO etc.) the Stakes listed in the lobby are the betting amounts for Limit games; in Pot Limit and No Limit rounds, the blinds are usually half of the blinds in limit games. 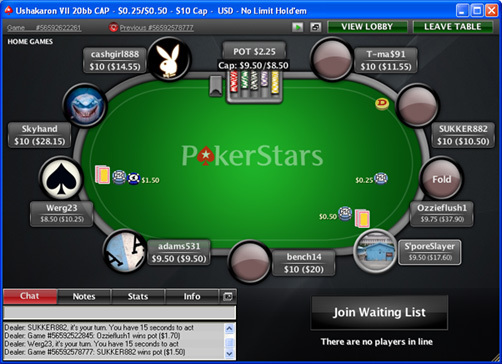 In Pot Limit or No Limit play, a return to the game at the same table after an absence of less than 120 minutes is still considered part of the same playing session. In such a case, a player must buy in for at least the amount with which they cashed out, or up to 10% less, if that's all the player has left in their account. The cap restriction on betting is a modification to the normal Pot Limit or No Limit betting rules. All other betting restrictions and rules not directly affected by the cap restriction remain in place as they would on a regular No Limit or Pot Limit table. The cap on betting is often expressed in terms of big blinds (bb). For example, on a $1/$2 No-Limit Hold’em table, ‘20 bb CAP’ would mean that each player can wager no more than $40 on each hand: 20 big blinds x $2 big blind = $40 cap. PokerStars currently offers only 20 big blind (20 bb) CAP tables. CAP tables display extra information at the table about how much more each player can bet before reaching their cap for the hand. The CAP table above illustrates the additional information available at these tables. This $0.25/$0.50 20 bb CAP table has a cap of $10 ($0.50 big blind x 20 big blinds = $10). This cap is clearly indicated in the title on the blue bar at the top of the window. In the example above, player ‘Werg23’ has already bet $1.50. The $8.50 displayed on their seat indicates the remaining amount they can bet this hand. The ($10.25) indicates how much money they have on the table altogether. Additional amount the current player left to act can bet / Additional amount the current player left can raise. In this case, "S’poreSlayer" has already paid a big blind of $0.50, leaving $9.50 left to bet this hand. Player ‘Werg23’’s raise to $1.50 means that the maximum that can be raised is an additional $8.50. This is displayed above the dealer tray as “Cap $9.50/$8.50”.